About 20 years ago, I never thought that someday I 'd grow African violets and write poetry. That time I taught as a lecturer at the Department of Informatics of the Belarusian State Economic University. But after the birth of my son I fell seriously ill and disabled, and, at once the first group. The diagnosis of "multiple sclerosis" left no hope that someday I'd can return to my old life. Me and my family did everything possible to stop the inexorable progression of the disease. But treatment did not bring me relief. And then I accidentally found out about the use of apitherapy in the treatment of sufferers like me. And by a happy coincidence found a doctor who in her spare time engaged in such services. Thanks to her, I took 12 courses. And contrary to the pessimistic mood shifts began for the better in my state of health. It was just then that I had a great desire to grow African violets and cyclamens. And they have been my favorite windowsill plants till now. My son got seriously ill at that already distant time. I put all my pain for him, all the fear in a prayer-poem ... And he recovered. And I wanted to write more. Maybe it's just a coincidence... But my first quality rustproof violet Huron blossomed just then. Its huge light blue flowers were maddening not only me. I read much later in one flower magazine, that the presence of blue African violets at home awakened creativity, mainly literary abilities!.. 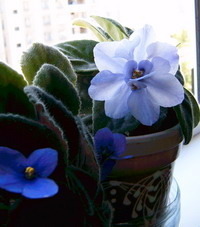 No wonder that I dedicated my first sonnet A Little Piece of the Morning Sky to my African violet Huron. After I had bought a laptop, I decided to show myself. According to the observations I know that most new authors have too high opinion of their own creations. I was one of that majority. By registering on the literary website with lots of all kinds of competitions, I decided to act. First I became to learn the products of competitors. And then I felt the shagreen skin that all contracting and contracting, began to turn me into a tiny insect. But I did not refuse ... And sooner or later my persistence was rewarded. I even took second and third places on a pair of contests. But soon the classes of poems, and flowers, too, had a long time to cover. My unforgettable mother became seriously ill. Three years before her death, and for some time after were the worst in my life. It's impossible to measure the depth of my love for her and estimate the value of my debt to her. My mother died on the ninetieth year of her life on Sunday 11 September 2011 on the birthday of her mother, Maria, too, that would have turned 125 years old that day. I wrote poem about Mom Your Exit a few days after her death. My mother served as the prototype of the heroine of the story Auntie Solomiya's Easter parables.